Painting exhibition by Adarsh Sinha dedicated to the 50th anniversary of the Russian Centre of Science and Culture was opened in New Delhi on February 18. 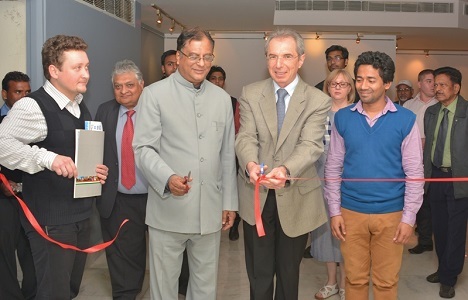 A week-long painting exhibition by Indian artist Adarsh Kumar Sinha, entitled “Beauty of Russian and Indian Architecture”, was opened at the Russian Centre of Science and Culture (RCSC) in New Delhi on February 18, 2015. K.K. Chakravarty, Chairman of Lalit Kala Academy, Government of India, highly appreciated the work of the young painting artist. Chakravarty said that the paintings testified to the eloquent expression of fusion and consonance of architecture of Russia and India. Sergey Karmalito, Senior Counsellor at Russian Embassy, referred to intrinsic details imbibed in each and every painting done by the Indian artist which demonstrated his unique skill, devotion and drive to future prospects in his profession. In this context, Karmalito recalled the significant observation made by Russia’s Ambassador to India Alexander Kadakin on the occasion of the release of the Album on Vasily Vereshchagin on December 5, 2014 on the joint restoration project to be undertaken by Russian and Indian experts on the masterpiece of the great Russian artist “Front Entrance of Prince of Wales in Jaipur in 1876” presently preserved in the gallery of Queen Victoria Memory in Calcutta. Earlier, Arseny Starkov, Chief Consultant of Information and Culture, RCSC praised the creative work of the young and promising artist saying that it contributes to the strengthening of Russia-India cultural ties and artistic interaction. In response, Sinha underlined the inspiration, encouragement, confidence and optimism he received from the RCSC to go ahead with his artistic mission. He especially cherished an opportunity to visit Russia a couple of time. The visits enabled him a lot to learn more about Russia, he said.